Top price of the day 20,000gns went to Graham Morgan, Cider Mill, Tillington, Herefordshire with the Intermediate Male Champion, Almeley Ginola, a 24 month old black & white son by Drybarrows Cawdale who sold for 12,500gns Carlisle May 2009 and out of a homebred cow Almeley Crystal. Ginola, a bull with exceptional growth and power was knocked down to Messrs Coates, Rainscar Farm, Stainforth, Settle, N Yorkshire to join their Greystone herd. 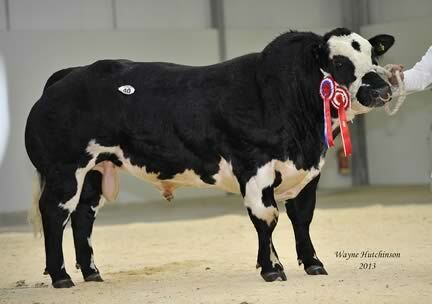 Graham sold 6 bulls to average 8,350gns with 5 of these by Drybarrows Cawdale which averaged 8,620gns. The judge, John White, Rigg Farm, Lunedale, Middleton in Teesdale, Co. Durham bought his Senior Male & Overall Male Champion Almeley Goliwog for 8,800gns which was also exhibited by Graham Morgan. Goliwog a 25 month old black son of Drybarrows Cawdale and out of the homebred cow Almeley Dipsy. Kevin Watret, Northfield Park, Annan took his third prize winning bull into the ring and was bid to 8,500gns for Solway View Gaddafi a 21 month old black & white son by Kelowna Charnock and out of a Gitan bred cow Bridgemuir Dolly ET. Gaddafi was purchased by T Robinson & Sons, Catlow Farm, Slaidburn, Clitheroe, Lancs. Kevin Watret also wins the Border Club Special trophy for the highest priced animal owned by a member of the Club. An intermediate entry from Andrew Price of the Bedgebury herd based in Kent took the next leading price at 7,800gns. Bedgebury General Lee ET, a son from the Bringlee Waldo and Wilodge Cover Girl flush stood 2nd to the Intermediate Champion in the show. General Lee is maternal brother to Bedgebury Flat Out who was the overall champion and top price of 15,000gns Carlisle May 2012. He was sold to RA Cadzow, Inland Pastures Farm, Scremerston, Northumberland. Also hitting the high spots at 7,200gns was a Heros Du Peroy (IS) bred son and second prize winning senior bull, Littlebank Gigolo ET, shown by HR & WJ Maudsley, Littlebank Bungalow, Settle, North Yorkshire. This eye-catching 25 month old, black & white bull out of Pendle Chattocks sold to EA & DA Ellis, Trevarrack, Leland, St Ives, Cornwall. Graham Morgan sold Almeley Giggs ET from the Empire D’Ochain (IS) and Almeley Rainbow ET flush for 7,000gns. Giggs stood 1st in his class and was knocked down to JA McGarva, Nether Abington, Farm, Abington, Biggar, Lanarkshire. Next in the price ratings, also from Graham Morgan was Almeley Gulliver by Drybarrows Cawdale and out of Almeley Delia. Gulliver stood 3rd in his class and was successful purchased for 6,800gns by DC Rees & Son, Pencrug Farm, Cradoc Road, Brecon, Powys. Two bulls sold for 6,500gns. The first entry came from Danny & Jane Wyllie, Pessall Farm, Edingale, Nr. Tamworth, Staffs with Tamhorn Gladiator, a May 2011 born bull, by Tamhorn Sumo (SR) and out of Noirette Du Fond De Bois, an exceptional breeding cow. He was knocked down to JH Sharp & Sons, Ivescar, Chapel-le-dale, Carnforth, Lancs. The other 6,500gns price tag went to Society Chairman, Andy Ryder, Blackhamilton, Blackford, Carlisle with his single entry Andys Grenade. This 20 month old entry won his class and went on to take the Junior Male Championship and was Reserve Overall Male Champion. Grenade is by the aforementioned Kelowna Charnock and is out of a Gitan bred cow Annanwater Black Beauty ET. Grenade was sold to L Guy & Son, Home Farm, Gilmonby, Barnard Castle, Co. Durham. The Female Champion & Supreme Championship went to Border Club enthusiasts Redhead & Watson, Bowsden Moor, Bowsden, Berwick-upon-Tweed with Tweeddale Hatty by their homebred bull Tweeddale Ebony (SR) ET and out of Tweeddale Euphoria ET. Hatty was purchased for 5,000gns by RJ & K Tiplady, Powis House, Longton Marton, Appleby.